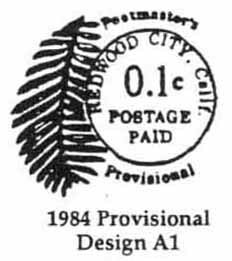 In 1984 and 1985, the Redwood City postmaster and the Washington DC office of the US Postal Service, Rates and Classifications unit gave permission to Craig Dremann to design and produce postmaster's provisional handstamps to use when mailing his company's seed catalogs. The proper bulk mail stamps were not available in 1984 or 1985, and the handstamps indicated that the full amount of postage was paid. 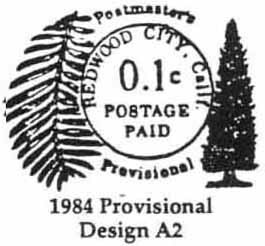 The handstamps are found on the Redwood City Seed Company's manila 6" x 9" open end catalog 20 weight envelopes, and the number postally used are noted below. 1984, April 3. Same as above, but this mailing required that self-stick labels be applied to cover the provisional because of a design controversy between Postal service branches in Washington DC. 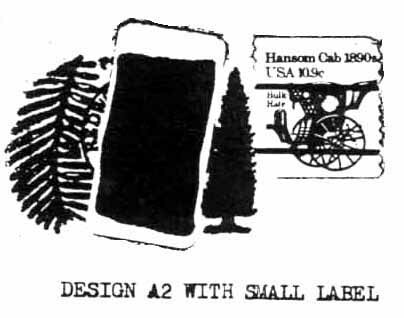 Self-stick labels either "small" (3/4" x 1-1/2") or "large" (1-1/2" x 1-3/4") were placed over the handstamp and the label marked with a 3/4" to 1" wide black felt marker to obscure the handstamp design. Quantities postally used are only known for each type and color, not for each label. Quantities postally used: 13XU5 (310), 13XU6 (321), 13XU7 (314), and 13XU8 (203). Plate block number 1, add______, or Plate block number 2, add______for covers with Hansom Cab stamps that have plate block numbers.